Left you in your wilderness for too long? It's a difficult place to be. Today we see in Psalm 13 David pouring out his heart to God. There have been wilderness times in my life where I have poured out my heart to God in prayer as David did in our Bible reading today. I can feel the desperation in David's cries of "How long?". I've prayed desperate prayers like that in the dark moments of my life. -In the struggles of marriage years ago. -In the darkness of a miscarriage. -In the three month back-to-back deaths of loved ones in my immediate family. -In the devastating diagnoses of Aspergers Syndrome, OCD, and ADD for our son. ...a gentle whisper calms my heart. Then, with a renewed sense of God's unfailing love - even in the wilderness times of my life - I can carry on because I know God loves me no matter what challenges or heartbreaks I may have to face in this life. Trust, rejoice, and sing because of God's unfailing love in the salvation that He is so good to provide for me. This truth is what we must hold on to as we patiently wait for the deliverance of God in whatever wilderness situation we find ourselves in. -Trust in God's unfailing love! -Sing the Lord's praise because He has been good to you! With an attitude of trust, rejoicing, and singing? I hope so...how about you? Whatever we choose to focus on during our wilderness moments will determine how we are waiting. Observations: I can almost feel the desperation of David’s prayer. 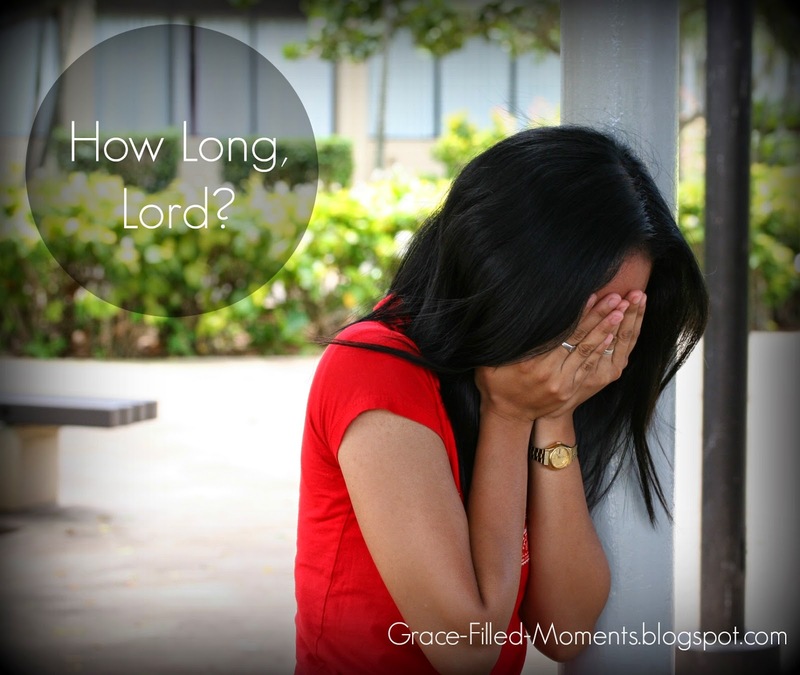 He repeats “How long” four times as he pours out his heart to God in prayer. But then we see a shift at the end of David’s prayer as he sets his focus on three things: 1) his trust in God’s unfailing love, 2) rejoicing in God’s salvation, and 3) singing the Lord’s praises. Application: Have you ever felt like God has forgotten you or that He’s left you in your wilderness for too long? I have, and it’s a difficult place to be. But there is beauty in the wilderness experiences of our lives too. It’s during those times that I have poured out my heart to God in desperation, crying out for Him to move on my behalf or the behalf of a loved one. It’s during those times that I have clung to the promises of God that I have hidden in my heart as we see that David did in this Psalm. Times that also have drawn me into His Word searching for truth and answers to the cries of my heart. These times are where I have experienced some of the deepest spiritual growth ever in my Christian walk. For that I am so thankful. Prayer: Heavenly Father, thank You for the wilderness experiences of my life that You have used to draw me in closer to Your heart. Thank You for the gift of Your word that I can hide in my heart to give me strength to walk through the valleys of this life, fearing no evil because of Your comfort that I find in Your word. Help me to trust in Your unfailing love no matter the circumstances of my life, to rejoice in the joy of my salvation knowing that it is eternal and this world is not, and to sing Your praises knowing that as I do my attitude will be transformed to walk in the victory that is mine as Your child even in the valleys of this life. I pray and ask this all in the faithful and life-giving name of Jesus. Amen! I always love reading your reflections Laurie! Thank you for consistently writing and sharing and encouraging and blessing. I appreciate you and your ministry here. Just beautiful! Thank you so much Courtney! Your thoughtful and kind words really mean a lot to me! I am so honored to be on this journey with you.